As global change-makers from governments, parliaments, civil society, academia, the arts and business, we work with policy-makers to bring the interests of future generations to the centre of policy-making. Despite our very different backgrounds, we are bound together by our common values: responsibility, compassion, respect, trust and our caring for the environment. Our actions and our failures to act – can decide the future of life on earth. The Future Policy Award: Combating Desertification and Land Degradation: More than 135 million people are at risk of being displaced by desertification. Dry lands cover over 30% of the Earth’s land and are extremely vulnerable to over-exploitation and climate variability. Dry lands are the most conflict-prone regions of the world. Together with the UN Convention on Combating Desertification (UNCCD) Secretariat, we will identify and award policies that effectively combat desertification and land degradation. The award ceremony will take place at the upcoming Conference of the Parties of the Convention in China in autumn 2017. We want to have a future just energy system based on 100% Renewable Energy and regenerative urbanization. We will build capacity and cross-sectorial networks among policy makers. To this end, we will host an impact workshop with parliamentarians and experts at the UN Climate Change Conference in Bonn, Germany. Children are human beings with a distinct set of rights. As part of our work to raise awareness of child rights, we will hold a high level policy hearing in Zanzibar to promote best policies on child protection and juvenile justice in Africa for others to emulate and publish these results. We will also intensify our work to promote Education for Sustainable Development with special focus on children’s rights to a healthy environment. Massive accounting and financial failures have sufficiently contributed to climate change and other environmental threats. Based on our innovative research, we advise decision-makers on how best to reform the central bank’s money creation policies to help fund the implementation of the Paris Climate agreement and the global Sustainable Development Goals. The combined explosive yield of the more than 15,000 nuclear weapons around the world is enough to destroy life on earth as we know it. Global military spending stands at over US$4 billion a day. This is an intolerable waste. We will promote measures to prohibit the financing of nuclear weapons and facilitate an exchange of best practices between Latin American and Balkan countries on reducing gun violence. Our Global Policy Action Plan (GPACT) catalysis breakthrough policies which represent tried and tested actions that have been in successful in one or more countries. The upcoming publication ‘BREAKTHROUGH – Building a shared human future’ will tell the stories behind these policies. We seek to establish Guardians for Future Generations at global, regional and national levels. We will highlight their value as catalysts for sustainable development and as principal advocates for the common interests of present and future generations. 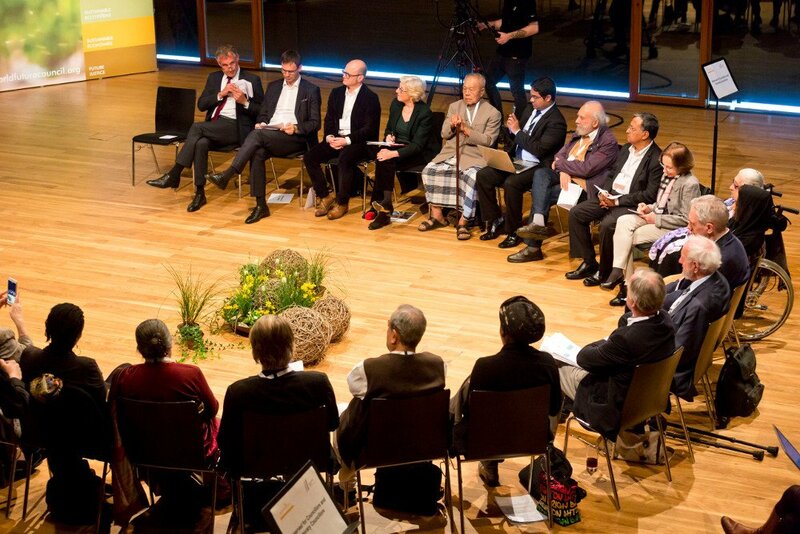 From March 30th – April 2nd, 2017 we, the Councillors, Ambassadors and recipients of the Right Livelihood Award from Africa, Latin America, Asia, Oceana, Europe and North America met at the World Future Forum 2017 in Bregenz. Austria, to tackle the global challenges ahead and shape a world that is just, sustainable, peaceful and that works for people of all walks of life. We convened in Bregenz on the invitation of the Mayor of the city of Bregenz, the Kongresskultur Bregenz, the city marketing of Bregenz, the Government of Vorarlberg, Convention Partner Vorarlberg, the Austrian Ministry of Agriculture, Forestry, Environment and Water, the Hilti Foundation and its partners. We will continue to engage with our partners in Bregenz to work for a sustainable, peaceful and just future. As stated in our commitment to future generations, we will do everything in our power to protect future life on earth in all its beauty and diversity, and promote for comprehensive peace and true justice between the world’s peoples and nations.